Take the family out on an adventure with this New 2019 Keystone Cougar 367FLS! At Lakeshore RV Center, we have the nation's lowest price on 2019 5th Wheel RVs and all other 5th Wheel models! That's why we're the #1 Michigan RV Dealer! If you have any questions, call us at 231-788-2040 or visit 4500 E Apple Ave Muskegon Michigan 49442 to find your dream Cougar! This rugged 5th Wheel is built for years of fun on the road! It's 40' 1" long, 8' 0" wide, and has a hitch weight of 2455 lbs! The 20' 0" awning opens easily to provide shade and protection for outdoor relaxing - rain or shine! With its GVWR of 14000 lbs, this RV will give you years of camping fun! Tired of cramped camping? You'll enjoy plenty of space inside this 40' 1" long, 8' 0" wide RV! It's also 12' 5" high, so you can stand freely without having to crouch! A stuffy camper is no fun for anyone, but you can enjoy nice, stable temperatures inside with the 15000 BTU a/c unit and the 35000 BTU furnace! 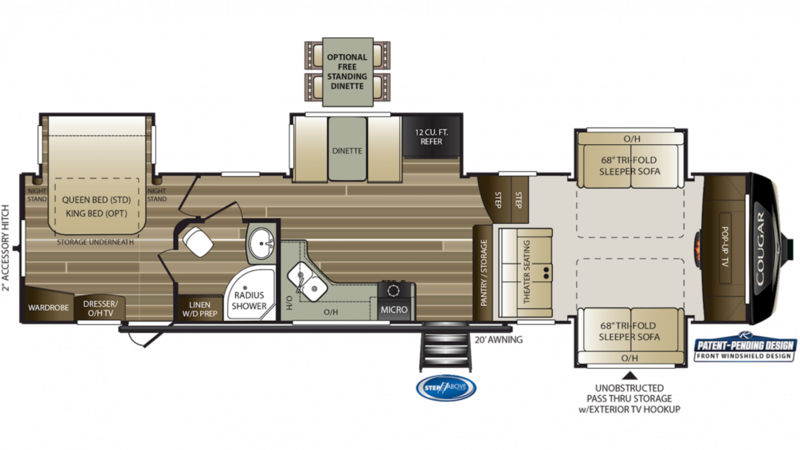 There are a total of 4 slides, so you'll receive extra space inside this 40' 1" long, 8' 0" wide RV when you set up camp! With its height of 12' 5", you'll be able to walk around freely without having to crouch! The interior's temperature remains comfortable and stable no matter how wild the weather may be outside, thanks to the 35000 BTU furnace and the 15000 BTU a/c unit! Comfort is a priority in this 5th Wheel, that's why it has a beautiful master bedroom that's spacious and private, with furnishings to store clothes and sundries, and a regal Queen bed where you'll sleep snug and secure every night! Everyone can sleep well inside of this RV, which has enough sleeping accommodations for up to 8 people! Your family will enjoy great meals with the kitchen, which includes a 3 burner cooktop stove and a 12.00 cubic foot refrigerator that will let you stock fresh food, fruits, and veggies! Don't worry about the kitchen running out of water, with the 81 gallon freshwater tank! No more trudging through the campground to the damp, chilly, messy public restrooms when you travel with the 2019 Keystone Cougar 367FLS! Instead, you'll have a wonderful bathroom complete with its own roomy shower, full sink vanity, and a sleek, graceful Foot Flush commode! You can enjoy a long hot shower, day or night, in comfort and privacy. And the big 81 gallon freshwater tank will provide plenty of hot water, heated by 60 lbs. of LP tank capacity! This RV has a 76 gallon gray water tank and a 38 gallon black water tank, so there won't be any bathroom-related issues on the road! Find ample space to store your favorite toys in the 0' 0" long garage. With a cargo capacity of 3037 lbs, you can haul your biggest toys straight to the campground! Even when the weather isn't cooperating, you can still huddle up around the indoor fireplace and stay cozy and warm!